Portland is home to 59 miles of unpaved roads. For some cyclists, these irregularities in our city streets might make for some challenging, if not dicey, moments in their daily commutes. For others, they can be a delightful detour opportunity. Regardless of one’s particular disposition towards these urban country roads, they are a fact of life that many people who ride bikes in Portland must contend with everyday and would be better off prepared for. So, what revolutionary new product that will-change-your-life-as-you-know-it do we have to offer you?! The Town and Country tire by Continental, of course! Unlike many on-road/off-road tires that never seem to be well-suited for either job, the Town and Country provides consistent and reliable performance both on the asphalt as well as in the shallows of a muddy pothole. Where many dual-use tires simply, and unsuccessfully, try to combine a slick center tread with a knobby edge, the T&C has a round and uniform profile that affords comfortable handling and predictable cornering. To be clear, the T&C is primarily a commuter tire, so it tends to roll best on the road which, given that MOST of Portland’s 4,842 miles of roads ARE paved, means you can still complete your commute without feeling like you’re riding a monster truck. But, when you need it, the T&C’s deep tread will carve a predictable path through Portland’s sloppiest back-alleys. 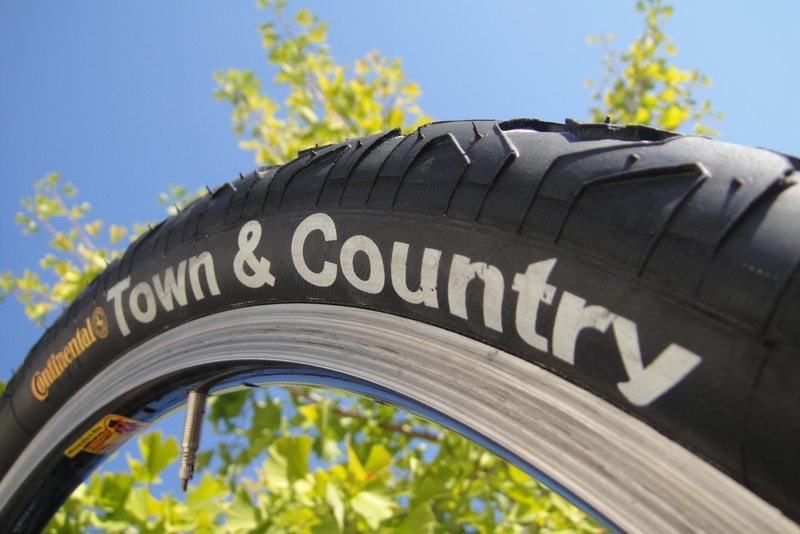 The Town and Country is not hand-made or local (made in India) but with its thick yet fairly light weight tread, this tire will keep you on the road many miles to come. The Town & Country retails for only $30 but unfortunately it can only be found in a size 26” (559 ISO). For more information, or to check out our tire selection, stop by our Bike Shop and chat with one of our friendly mechanics.